Argentina leads Latin America in English proficiency, and the language is both widely taught and widely used in the country, including in business, media, and schools. However, a slowing economy and political uncertainty have slowed outbound mobility this year even as interest in English language learning remains strong. Despite the fact that English is a foreign language in Argentina, it has long been prevalent within the Argentine upper classes as well as some sections of the middle class. This is mainly due to immigration from England that began around 1800 and picked up steam after Argentina achieved independence in 1825. Today English is widely used in business and media and has left its stamp on the education system, which features numerous bilingual and English-only schools. Argentina ranks 15th in the world in English proficiency according to the most recent English Proficiency Index released by Education First (EF). 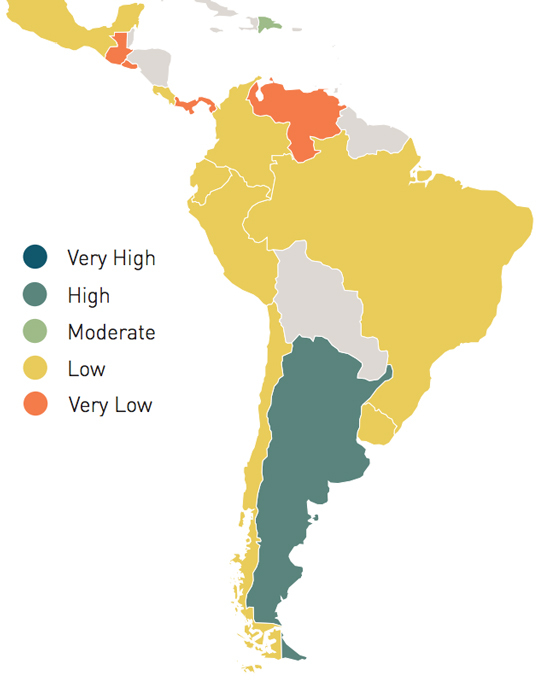 Moreover, the country has by far the highest level of English proficiency in Latin America, as shown in the graphic below. The British Council’s latest survey in Argentina asked those who had not learned English what would motivate them to do so, and 65% answered that they would do it to improve their employment prospects, reflecting a widespread understanding that English proficiency is closely tied to employability. However, affordability was the biggest barrier – in the same survey those who had not learned English cited prohibitive cost more often than any other factor. English became part of the public school curriculum during the early 1900s. Since 2006 learning a foreign language has been compulsory in all primary and secondary schools, with different provinces determining which languages are taught. English is the most common choice, but French, Portuguese, Italian, and German are also widely taught. Public universities, which account for about 80% of undergraduate enrolments, set their own policies with regard to language learning. Many of those that feature English use exit requirements for proficiency, rather than entrance requirements. Classes tend to focus on reading comprehension and vocabulary, placing less emphasis on spoken English. The private English-language teaching market is varied and competitive. The most established companies include Liceo Cultural Británico, Instituto Cultural Argentino Norteamericano (ICANA), and Asociación Argentina de Cultura Inglesa (AACI). Some universities also run private ELT courses, both free and for profit, that are open to the public and often focus on exam preparation for international certificates. In addition to these there are also small schools run by teachers, as well as numerous private tutors. The British Council has also found informal English learning to be a popular trend. Two-and-a-half million Argentines find their own ways to learn English, mostly relying upon textbooks, television, radio, and online products. The wide availability of English-language media from the US may contribute to the preference young Argentines have for the North American English dialect. When the British Council asked those who had not yet learned English which type they preferred, twice as many chose “American English” as did “British English.” But among those who already were in English classes, the British variety was preferred. In the last few years, teaching strategy in much of Argentina has shifted toward an intercultural and multilingual approach designed to recognise global linguistic diversity and treat English as one language among many, with no more value than other foreign or indigenous languages. The aim is not to diminish English, but to give it a global context and make it about more than students’ future job prospects. The hope is that this will better engage students and allow them to consider their own language and culture in the same light. This is a bold approach in a country that ranks as one of the least culturally diverse in the world – on the level of Haiti, Rwanda, and the Dominican Republic, according to Pew Research data collected in 2013. While Argentina boasts cultural influences from a few European countries, Spanish remains nearly universally spoken, 97% of the population self-identifies as Caucasian, and more than 90% are at least nominally Roman Catholic. a large number of teachers working outside their area of expertise. Furthermore, a lack of a national English-language learning policy has contributed to the persistence of such problems. However, Education First offers a sunnier assessment. Argentina is the first Latin American country to achieve high proficiency in EF’s EPI rankings. Minh Ngan Tran, co-author and editor of the 2014 EPI report, commented that Argentina’s ranking was achieved through improvements to the education system. “The government has invested in public education and in training English teachers to ensure a solid language level,” he explained to the website ArgenconNews. While teacher quality is a subject of debate, one challenge that is generally agreed upon is Argentina’s economy. Growth has been minimal in recent years. Coupled with high inflation that has hurt the peso’s value against foreign currencies, the impact on incomes has been considerable. This has also placed a drag on outbound mobility, whereas the number of foreign students flowing into Argentine universities has more than doubled since 2006. The affordability of tertiary education is a factor as well. Many students improve their English proficiency at university, but even free education cannot put schooling within reach for lower-income Argentines due to associated costs such as transportation, study materials, and accommodation. There aren’t many scholarships, leaving such students little means to bridge the financial gap. For those who do enter university, the dropout rate is high. It has risen in tandem with the introduction of foundation programmes in some provinces that add a year to schooling, and economic difficulties that force students to leave school in an effort to earn extra family income. However, the unemployment rate – especially for youth – has also risen sharply, placing young Argentines in the situation of seeking work in a shrinking job market. These problems are all well known. How they are tackled depends in part on national politics, and the direction of the government is currently in question. A national election last week could have addressed doubts, but it instead left the future cloudy when it failed to produce a winner, requiring a 22 November run-off between two candidates with potentially opposing education agendas. This entry was posted in Argentina, Language Learning, Regions, South & Central America and tagged staff mobility, tertiary education overseas, student enrolment, education abroad, private education.